O lord god, You are sanmrath - all knowing, omniscient dhaathaar - forever and ever giving to the whole world. O great guru, O sathguru, O true guru, eternal guru dhaehi - please bless me with this bheekhiaa - with this gift. Please bless me with what I am begging for in front of You now. So Gurmukh piaareyo guru maharaj is beginning this conversation with Akaal Purakh, begging from the door of Akaal purakh. Sathguru Maharaj jee is teaching us the paths to uniting with Akaal Purakh. Maharaj jee says that please bless me with this bheekhiaa - with this gift. What gift is maharaj sahibjee talking about? Lab - that greed for what I can consume and lobh -that greed for all those things which I can get together, all those things which I can collate, Maharaj sahibjee is saying, parajaaleeai - please burn them away. Naam milai aadhaar - by removing this ego connected to your body, thinking that it's superior to other with garab - the ego connected to your virtues, thinking that they are superior to others, anhankaar - the ego connected to your wealth - thinking that you have all that there is to have. Kaam krodh - all the desires and all of the anger, lab - all of the greed to keep consuming and lobg - all of the greed to keep collating Maharaj shaibjee is saying parajaaleeia - please burn these away O Akaal purakh. Naam milai aadhaar - at this point when all of these sins have been burnt away please bless me with the adhaar - with the sustenance of only Your naam. Let that be my only desire. Let that be my only hunger. Let my only thirst be for the naam - the name of the lord. As Sathiguru Naanak Devjee says, Saachae naam kee laagai bhookh - may I have the bhookh - may I have the hunger within me for the true name - for the Satnaam - for the eternal name of the lord. Maharaj sahibjee goes on to explain to us naam keho jeha - what is the naam like? Day and night, Maharaj sahibjee is saying just like soap - no matter how many times you rub soap against something dirty the soap never gets dirty in the same way Waheguru jee's naam has purified so many sinners in the past and it is purifying so many now and will purify countless in the future but mailaa kbehoon n hoe - it never takes on any of the mail - any of the dirt of any of the sinners, any of the sins of all of them. Forever and forever it's always washing away all the sins. Every time we say Waheguru, every time Maharaj sahibjee blesses us with meditation it's always washing away Maharaj sahibjee says, mailaa kabehoon n hoe - it can never be dirtied, it can never be soiled. Maharaj sahibjee says ahinis - for day and night, forever and ever it is navathan - meaning ever new. What does that mean? Those gurmukh piaarey when they meditate upon the naam, every time they do nitnem, every time they connect, every time they meditate upon the lord, every time they read their banis they find navathan - they find something new. Each time that name of the lord is always new, each time you take it, every moment! 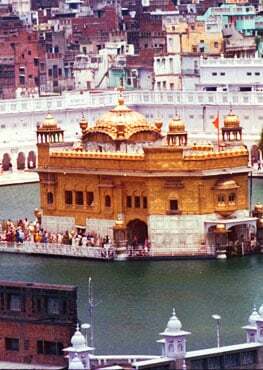 Because the name of the lord, the bani of the guru is an ocean which has no end, it's limitless therefore every time you go into this ocean, if you are looking for them, if you've learnt to look for them, if you've subdued all of these egos, all of these desires, all of these angers, if the greeds have been burnt away then every time you go into the ocean there will be something new which you can grab hold of, every time. Many people ask what is the point of reading bani everyday? The bani is navathan, sahib mera neeth navaan - Maharaj sahibjee says that my Akaal Purakh everyday is neeth navaan - every second is new. There is always something new being found in the paath. Every time you do paath, every time you do nitnem, every time you meditate upon the lord there will be something new but if you've learnt how to search for it. Maharaj sahibjee nirmalaa - it is ever purifying mailaa kabehoon na hoe. Maharaj sahibjee says eih bidh shetteeai - this is the method for liberation. What is the method? By firstly going to the door of the guru and saying Sathigur bheekhiaa deh meh - hey Sathguru, O knower of all, O great giver - what does this mean? We realize that Maharaj sahibjee is samarath - if we are going jin man hor mukh hor sae kandhe kacheya - if we asking for something else with our mouth and asking for something else with our mind Sathguru Patshahjee knows. Maharaj sahibjee is saying that with your mind and your body and your words go in front of Sathguru - the true and ask for this bheekhia - ask for this charity, ask for this blessing firstly to have the method of begging which is truly inwardly and outwardly believing that Akaal purakh is samrath - is all knowing, is dhataar - the giver, to have that faith that whatever you ask: baarik mukh mangay so deena - whatever the baarik - whatever the child asks for the god will give, that is the way to go in front of the lord and beg. My than - my body is overflowing; eaetharrae with avagan - with faults, with bad qualities. Khasam n faerae chith - that is why my khasam, my husband lord n fairae chith - doesn't even bring me into His consciousness, doesn't even consider me. Another meaning of this line is: O Waheguru sahibjee, this is doing an ardhaas in front of the lord, O Akaal Purakh mai than avagan eartharrae - my body is full of so many bad qualities, of so many faults, of so many vices. As we hear the ardhaas in bani we hear the prayers, the words of supplication: ham avagun bharae - I am completely full of avagans eaek gun naahee - I don't even have one virtue - Maharaj jee is saying that this is how you should do ardhaas. Mai than avagan eaetharrae - I am so full of vices that khasam n faerae chith - hey khasam, hey my husband lord why do You not faeare chith - fearae means to turn around the mind, chith meaning the consciousness. Oh my husband lord only if You were to turn around my consciousness, only if You were to turn around my mind then these avagans, these vices would be removed from me. I am balihaaree - bal means power, haaree means to surrender. Maharaj sahibjee says surrender all of the power of and all of the ego of your body, of all of your wealth, of your virtues. Give up of these egos and surrender yourself thin ko - to those blessed beings sifath jinaa dhai vaath - who with their mouth sing the sifath - sing the praises of the lord. Sometimes, most times it is our ego which stops us from picking up the jewels which we need in order to decorate ourselves for the lord god. Maharaj sahibjee is saying balihaaree - give up all of your ego, give up all of your clever tricks, surrender yourself to those gurumkh piaare who with their tongues sing the praises of the lord. To those gurmukh piarey put forward this plea - sabh rathee sohaaganee - Oh happily united soul brides all of you are rathee - imbued with love, are united to my lord god eik mai dhohaagan raath - and there is only me who is the dhohaagan - who is full of vices and who is separated from the lord. Please unite me so that I can have at least eik raath - just one night with my husband lord. That I can walk upon one part of this ladder, that I can take one step towards my lord god. Please help me so that I can take these first steps; eik mai dhohaagan raath - so that I can be imbued into His love. Dhar - at Your door O lord god Waheguru I mangath - I am a beggar. Jaachai dhaan - I am begging for this gift, for this grace har dheejai kirapaa kar - O Hari, O Waheguru who brings life to all dheejai please bless me kirapaa kar - with Your grace. Please bless me, make me a gurmukh, make me a follower of the guru through thick and thin. Laehu milaae - unite me with Yourself. Guramukh laehu milaae - please unite me with the gurmukhs - with the sadhsangat - with the congregation of those who meditate upon You. Jan paavai naam har - in the saadsangat this jan - this humble servant is blessed with naam har - the name of the lord, of Hari, of Waheguru; Hari - who destroys all of the sins of all. Sitting in the saadh-sangat repeating Waheguru Waheguru Waheguru with my tongue may I be blessed with that stage of anehadh sabadh where ajapaa jaap - meaning that state of meditation which is beyond all states of having to start the meditation. That ajapaa jaap carries on itself, that ajapaa jaap - that name of the lord which then resounds through the trees, which resounds through all of the universe. Anehadh sabadh vajaae - one day there were some students learning from Sant Baba Sundar Singh Jee Khalsa and they asked Sant Sundar Singh Jee. They said, Babajee please is there this avasthaa, is there a state of being where all of the world, all of the buildings even, all of the sky, all of the ocean which is mentioned in gurbani: dharath paathaal aakaas hai maeree jindhurreeeae sabh har har naam dhiaavai raam | dharath - the ground paathaal - the nether regions, aakaas - the skies, hai maeree jindhurreeeae sabh har har naam dhiaavai raam - all of them meditate upon the lord, please show us this state of being. Sant jee got all of them to sit, amongst those students were Sant Gurbachan Singhjee Khalsa and when Sant jee got them to meditate almost instantaneously they started hearing, even in the bricks and water they were sitting in they could hear bricks and water meditating Waheguru Waheguru Waheguru Waheguru. After eight days of being in this type of avasthaa - after eight days of being in this state of bliss Sant jee said to all of those Singhs, to all of those students that now you must meditate yourself and you can also reach this avasthaa - this state. I've shown you this as father picks up his son upon his shoulders and shows him the melaa - the fun fair but now you must progress spiritually and proceed there yourself. Out of those students Sant Giani Gurbachan Singh jee reached those levels of awareness. Jotee jot dhar - hey Waheguru give me that avasthaa - that state of being and jothee jot dhar - let my aatmaa merge in with paramataama - with the highest soul. In this world Waheguru jee is varathai - pervading through all aap - themselves. Har saethee preeth kar - Maharaj sahibjee is giving us this final updesh, this final method in this last line of the shabad har saehee preeth kar - have love for Hari, for Waheguru. saethee means with, with the lord god. Hey Waheguru, hey Hari please bless me with Your preeti - with Your beloved true love that I may meditate upon You at all times. So in this shabad today Guru Naanak Devjee Maharaj is blessing us with the gift of how to beg from the lord. When you've learnt from those sohaganees - those soul brides who are blessed with being united with the lord of how to beg from the lord, of how to pray to the lord then whatever you ask for, whatever you beg for jo maagehi thaakur apunae thae soee soee dhaevai but firstly you have to learn how to get to that stage of mangai - how to get to that stage of begging and putting that prayer forward to the lord.